Drive the car into the fast flowing white water rapids you say? Errr… OK! I'm going to start this piece with an admission. I'm not really a SUV kind of guy. I like cars with classically-styled European lines - low, smooth and gentle curves are my bag. I'll take a 612 Scaglietti over a Mustang, my own Alfa Romeo 156 2.4 JTD 20V over a BMW M3, a Jaguar E-Type over basically anything. As such, when we decided to go hands on with the new Jeep Renegade at T3 Towers, I wasn't the natural candidate to go out for a spin. I have, for years, also been highly sceptical of small-scale SUVs that advertise themselves as a one-stop solution to all your driving needs. You know the score - vehicles glossily advertised in the outback but only ever driven on the suburban school run. I think though, after lazily dismissing many of these machines with a “go buy a Range Rover” quip, or remaining superficially engaged due to my aesthetic preferences, I may have been mistaken in writing them off. I think the turning point was when I drove the Jeep Renegade for over 10 minutes in high-grade white water rapids, with the water at times rather hairily reaching up underneath the door handles. However, we'll get to that later - first of all let's talk about any vehicle's natural habitat, good old tarmac. My time with the Jeep Renegade began, true to my usage conception of this type of vehicle, on my suburban, pebbled drive in Bath. It looked at home too, with a brace of other-brand SUV's inhabiting neighboring yards. Jeep has refreshed the looks of this vehicle well, with - in my mind - just the right amount of pimp thrown into its classically-styled DNA. 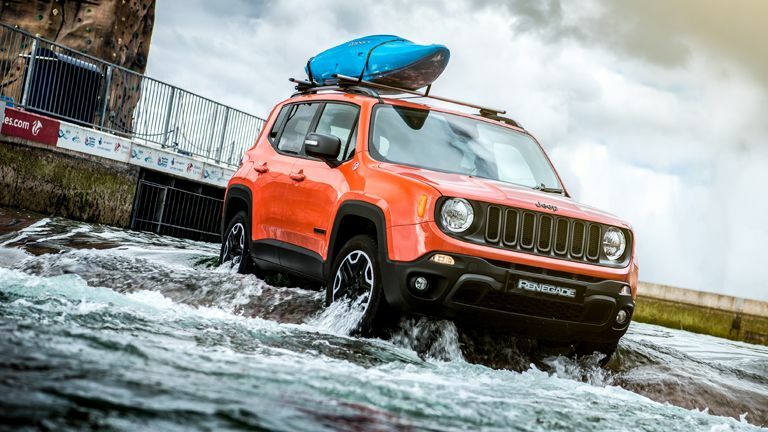 For example, Jeep's distinctive and traditional seven-slot grille remains very firmly in-tact here on the Renegade, however the body panels hug the chunky frame with softness you're not use to. Equally, other design details such as the flash 17-inch aluminium wheels, a two-tone colour scheme and futuristic front and rear bumpers take the edge of the lingering military-style vibe that has dominated past vehicles in Jeep's range. Simply put, I like the Renegade's design - it feels like Jeep has finally caught up design-wise with its competitors. This is very much welcome, as this vehicle is definitely sold on it ability for both “hitting the town or exploring further afield”. I don't want to pick up my daughter from school and then drive around Bath, with its soft stone and Georgian architecture, in something that looks like a miniature tank. So, what about “hitting the town”? Well, the drive is smooth, quiet and - in the surprisingly large cabin - relaxingly detached. A tight gearbox allows gears to be slotted into with a reassuring thwuck, while the diesel engine is pretty quiet too, humming along and very quickly fading into the background when idle. The Renegade isn't unwieldy to weave through Bath's suburbs either and, when breaking out into national speed limit country lanes leading away from the city centre - where nifty features such as the Stop/Start system regularly came into play - only the smallest hint of body roll is noticeably when really gunning it into the twisting bends, with the Renegade handling well for its class. Acceleration is solid and, now cruising West-bound on the M4 motorway, I definitely notice the advantages of its high driving position, as well as features such as its blind spot and lane monitoring systems. The on-board computer and touch screen works intuitively too, with me achieving a high level of operability without reading reams of documentation. Utilising the Renegade's map screen, for example, is easy and I could plot my destination of Cardiff with ease. Why Cardiff? Well, it's a nice city for sure, however the real reason I was driving to Cardiff was to test out the real benchmark as to whether this vehicle would succeed or fail, its off-road capabilities. This was to be undertaken at the Cardiff International White Water, a demanding whitewater rafting course where we could not only take the Renegade off-road, but could plunge it into deep, fast flowing water. And I've got to be honest, upon seeing the course with its water flowing and rapids churning, I wasn't terribly convinced that I'd return terribly dry. I mean, just getting the vehicle into the water required carefully navigating it down a brace of metal gangplanks close to a 45-degree angle - and that was even before the front bumper touched the water's surface. If I'd been in something larger and, for want of a better phrase, more industrial looking, rather than a small-scale SUV that in my mind previous to today's adventure I though you would only ever use to drive to Waitrose, then I think I would've felt better. And, even when I drove the Renegade into the rapids and sat there, water streaming around the vehicle, there's definitely a mental disconnect as, well, cars aren't supposed to be in deep white water rapids are they? If I'd been in the same situation in my own car I'd be in serious, serious trouble. Maybe if you spend most of your life driving around in 4x4 you mind is programmed differently. Got to say though, at all points the Renegade handled the course without issue, despite the water and despite the numerous dips and troughs with steep cambers that needed to be negotiated. No water entered the cabin either, despite me constantly expecting it to, and after a couple of minutes I found navigating through the course gates to be quite straight forward. Even turning and then driving back up against the torrent was markedly undramatic - the Renegade gripped the stone and metal surfaces beneath the rapids with ease, constantly pushing forward. By the end, while still not totally comfortable with the idea of driving in this level of water, the ease and comfort in which the Renegade had allowed me to do what I had just done - so spend a good 10 minutes driving, reversing and turning in deep fast flowing water - had taken the edge off my fear and proved the vehicle's off-road capabilities quite spectacularly. In fact, as I was soon to discover in a post-drive white water rapids session of my very own, wetsuit included, the true fear was still to come! For more information about the Jeep Renegade then check out its official website.